A few people have been asking me some more questions about Division 3. I’ll answer them here in this update. But keep in mind that we will also hold a meeting soon with all Division families invited. That’s when the organizing and planning can really start. Where will we be staying? Do we have to stay with the team? We have a volunteer parent working on trying to get us a good deal on a hotel near the pool. We don’t have a final count on the number of rooms we’ll need, so nothing has been decided yet. We recommend everyone staying at the team hotel, but if anyone has connections in Windsor, you can certainly stay there. However, if you do stay elsewhere, you still have to be able to make some team meetings and get to the pool at the appropriate time. What will we do for food? Do we have to eat with the team? I’ve been a part of some wonderful Division experiences in the past, and have learned some nice tricks. If we reserve a meeting room at the hotel for the whole time we are there, then we can turn it into a food room. This means that the swimmers do not have to go to restaurants for their meals and snacks. This saves an incredible amount of time (when they should be sleeping), but also saves an enormous amount of money. The only downside is that it requires a lot of parental assistance in terms of organizing, buying / preparing food, clean up, etc. Meal costs would be split between families. Any family is welcome to eat on their own, but you still have to be able to make team meetings, and be at the pool on time. Keep in mind that there are very compelling financial and swimmer relaxation reasons for renting and using the food room in the first place. Will we have much free time in Windsor? In a word, no. This is a team event, and so we are asking everyone to come for finals to cheer on our relay teams and our finalists, even if your swimmer is not in finals. Our older swimmers will have morning heats and then late afternoon finals. The afternoon will be spent either napping or quiet activity. The younger swimmers will have early afternoon finals (no heats for them – all swims are finals) and then relays at the late afternoon finals. We’ll be finished by 8:00 pm or so, meaning when we get back to the hotel the swimmers will eat and then head off to bed. Are we staying over Sunday night? That is completely up to each family. Many may want to drive back Sunday night in order to work on Monday. But if any want to stay we just have to let the volunteer hotel coordinator know in order to reserve the room. However, we are asking all families to stick around until our last swimmer is finished Sunday night. 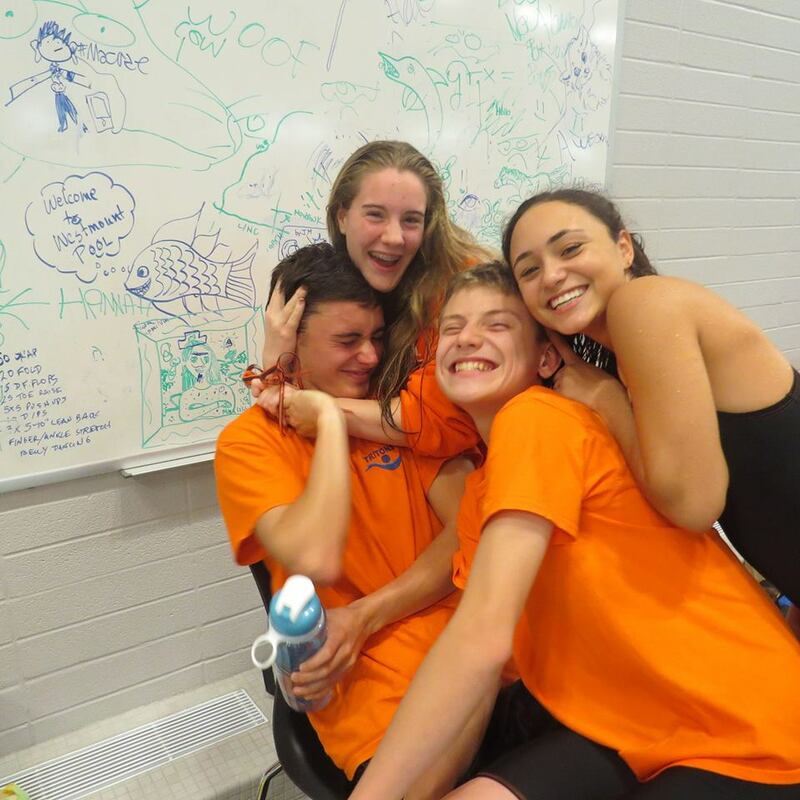 It is especially important that families with relay swimmers do not leave early, as the relays are the highlight of the meet, and our best chance at points. Has the team been announced? We have started notifying selected swimmers and their families, and most have confirmed. We still have a few more who haven’t decided yet. How fast is Division 3 is compared to other meets? This is an interesting question. It depends completely on where it is located, and that’s because of the way teams are assigned to the different Divisions. In general, if a team skips Divisions for a few years, when they return they have to start in Division 3. And there are many Toronto area teams who will only go to Divisions if they are in the Toronto area. For instance, last year Division 3 was held in Etobicoke and so some very strong teams who don’t usually participate in Division, such as Ajax, CCAC and a few others, decided to go. As a result, last year’s Division 3 was unusually fast – about as fast as Division 2. But in previous years when it was in Sudbury or Thunder Bay the meet was much slower and with far fewer teams. We’re anticipating that this year it may be on the slower side again, so we’ll make some predictions on that assumption. Keep in mind that the huge variability in results from one year to the next can make these predictions look rather foolish. 8th place for girl’s events will most likely be roughly halfway between Central Region qualifying times and Provincial qualifying times (or possibly a little higher). 8th place for boys events will be generally a little under CR qualifying times, except for 15&Over boys where it will be little more competitive.